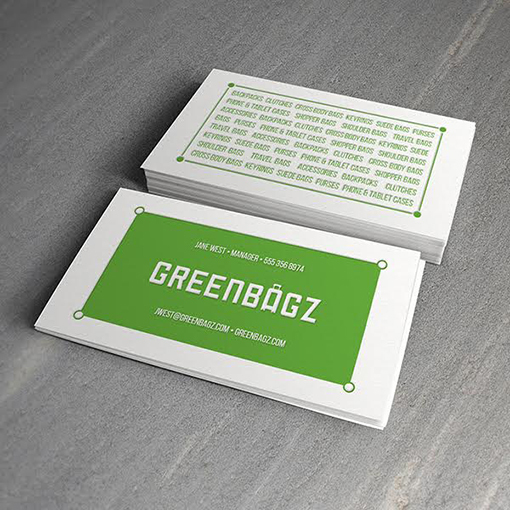 These business cards feature a simple design with green PMS ink on white cardstock. Printed in a fun display font, the logo makes it clear that the design's inspiration comes from the Greenbagz name; the letter "A" is shaped like a handbag to remind recipients of the brand's main product. The card's front side places contact information above and below the logo. On the back of the card, the color scheme reverses to use green text on a white background, helping recipients distinguish the card's two sides. The back panel's product list is organized as a single paragraph to make the most of the small design area.